Not to be confused with Playtech’s other 2014 release, Cat in Vegas! 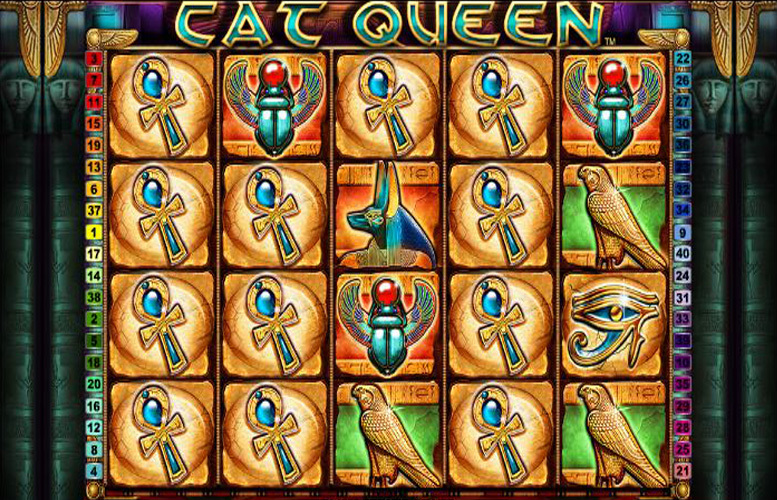 The only cat in the Cat Queen Slot is the Ancient Egyptian goddess Bastet (which acts as a symbol on the reels). And maybe the queen herself if you consider the ears on her headdress. But enough talk about mythological felines – let’s see how the Cat Queen performs where it really matters. The highest fixed Jackpot in the game is a measly 1000 coins. That doesn’t sound very appealing. If we take the lack of a progressive Jackpot into consideration, there’s nothing there to actually motivate players to make big money. At least the 40 paylines almost guarantee a win every other turn. If you’re lucky, you can double your current win, half-double it, or collect what you’ve won so far and continue playing slots. 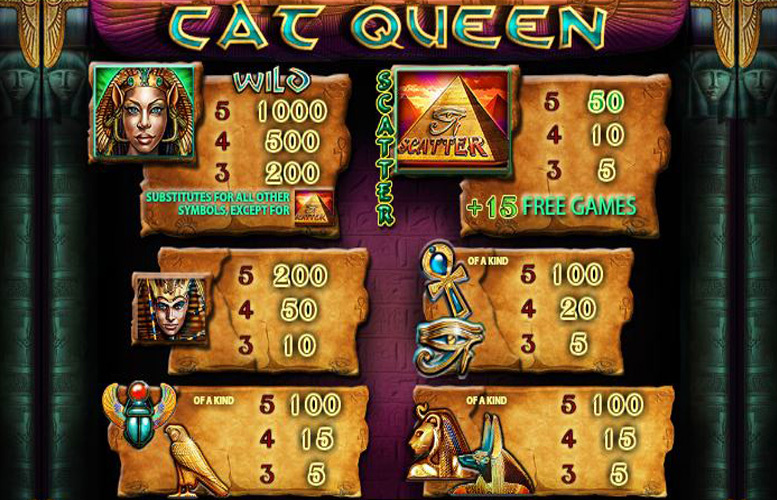 Returning to the Cat Queen Slot, we definitely need to mention the opportunity to win free spins. Simply get three or more Pyramid scatter symbols on the reels, and you get 15 spins on the house. The good news is that there is no limit to this occurrence. That means if you get another one of these lucky combinations, you’re also awarded another 15 spins! Good thing they didn’t put a cap on this feature, as the lowly Jackpot offered by the game is not much of an incentive to continue. This slot has no shortage of symbols – which makes for a confusing experience at times. Especially when combined with the copious amount of paylines. The Wild (and obviously highest paying) symbol is the Cat Queen. Get five of these in a row and score 1000 coins. The only difference between the last three symbols lies at the 4-of-a-kind bonus for the Ankh and Eye of Horus symbols. You get 20 coins for that combination, whereas the other two only yield 15. It makes you wonder what Playtech had in mind when programming this slot game. Hey, at least we’re seeing a change from the usual Poker card symbols! At any rate, your eye should also be on the Pyramid scatter symbol. You can recognize it by the Eye of Horus staring back at you. 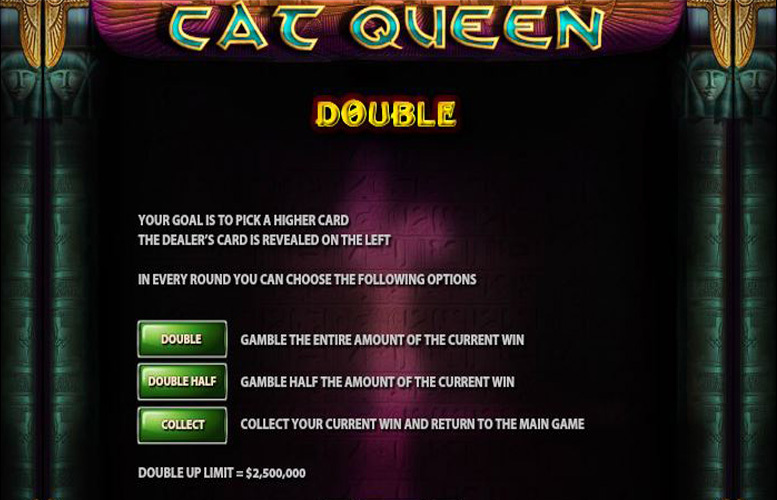 When it comes to betting limits, the Cat Queen Slot is on the average side of things. The minimum coin value is 0.01 of your denomination, while the maximum is 20. As such, if you play with all paylines you can expect a minimum bet of 0.40, and a maximum of 800. Not too shabby, but it definitely won’t catch the eye of high-stakes bettors. We’ll be honest: Playtech had the potential to create something great with the theme they were working with. Unfortunately, they didn’t quite manage it. The betting limit is fairly average, and the high number of paylines ensures a lot of smaller wins in the long run. That won’t cut any of the game’s other faults, however. 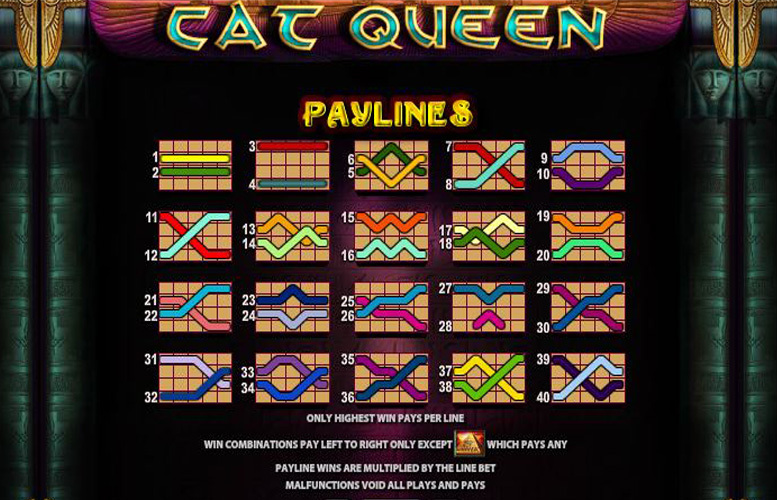 For starters, the Cat Queen Slot symbols have very little to offer in terms of variation. Not regarding their design, as that works quite well with the rest of the game. We’re talking about the payout for the winning combinations. What use are 6 symbols which offer pretty much the same stakes (with minimal variance in the case of the Ankh and Eye of Horus)? Then there’s the 1000 coin Jackpot for 5 Wild symbols. If there ever was an underwhelming prize, it’s this one. The Cat Queen Slot remains a below average experience that could have used its mythological potential a bit better. At least the graphics are nice. This game has a rating of 8 / 5 with 493 total reviews by the users.